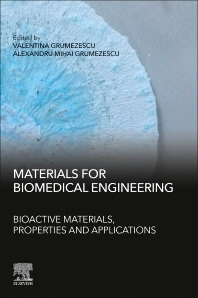 Materials for Biomedical Engineering: Bioactive Materials, Properties and Applications introduces the reader to a broad range of the different types of bioactive materials used in biomedical engineering. All the main types of bioactive materials are discussed, with an emphasis placed on their synthesis, properties, performance, and potential for biomedical applications. Key chapters on modeling and surface modification and methods provide the step-by-step information needed by researchers. Important applications of bioactive materials, such as drug delivery, cancer therapy and clinical dentistry are also highlighted in detail. Final sections look at future perspectives for bioactive materials in biomedical engineering. Valentina Grumezescu is a Scientific Researcher at the National Institute for Lasers, Plasma & Radiation Physics, Magurele, Romania. She is an experienced researcher in the field of fabrication of biomedical thin coatings by laser processing. She has published over 40 research and review papers in the field of nanobiomaterials and several book chapters on the application of laser processing in biomedical field. She is also the assistant editor of the journal Biointerface Research in Applied Chemistry.